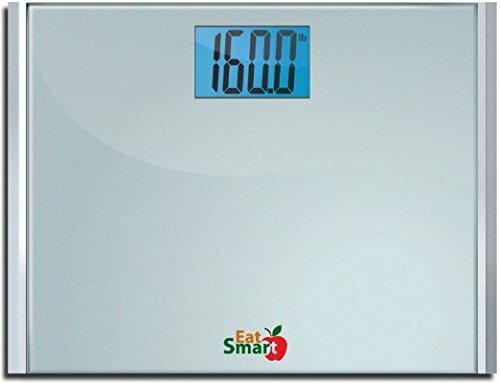 EatSmart’s Precision scale Is a digital scale with a tempered glass top and Accubright LCD technology. Fitted with a quartet of precision gauges, it can take accurate measurements by gradations of 0.2 lbs. It has the capacity to take precise measurements of up to 400 lbs. Software uses a “trick” to produce apparent consistency in results: it recalls the last weight that was taken, then compares it to the current measurement. If the current measurement is within a 0.5-pound difference compared to the last one, it returns the last measurement. For instance, if the last measurement was 10 lbs and the new measurement is 10.4 lbs, it will turn the current measurement into 10 lbs instead of the actual 10.4 lbs. This is a fairly accurate scale, even in spite of the trick its software uses to boost its consistency. You can get around that anyway by just weighing something else in between your weigh-ins. The screen is very nice, being extremely large and well-lit, and the step-on and auto-shutdown technology makes using the product a breeze. The ability to report in any of 3 units is useful as well. On the whole, it’s a sound buy for the reasonable price. There are comparable scales on the market, of course. EatSmart itself makes some not too dissimilar products that might be of interest to digital scale shoppers. Below are two of them that might be worth considering too as they come from the same series: the Precision Premium and the Precision Plus. Labeled the premium version of the Precision series, this model carries all the traits of the base model but omits the option to take weight measurements in stone. 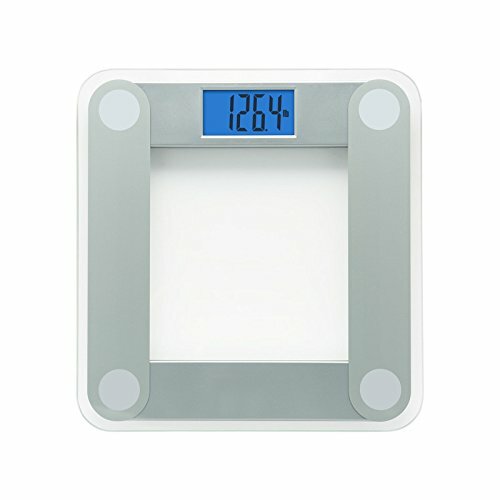 It also replaces the tempered glass construction of the basic Precision scale with a non-slip black plastic top combined with aluminum accents and an aluminum base. Other than that, all the essential features are the same, from the maximum weight capacity to the warranty (2 years). The rubber feet at the base are sometimes not mounted properly, and this can have a huge impact on the accuracy of the readings. Moving them into place (this can be done at home and without any tools) solves that problem, fortunately. This is technically a more expensive version of the Precision, at least where list prices are concerned but it is currently cheaper when buying online. Aside from the issue with the mountings, there is little to gripe about with this scale which is a very solid performer in every area. The plastic and aluminum styling is not only attractive but highly durable, the super-thin profile renders it easy to store, and it will also deliver accurate (or extremely close to it) readings almost every time. This is the widest of the Precision models with a huge, 12×15 in platform, and a similarly large 4.3 in backlit LCD display. Even its maximum weight capacity is upgraded to 440 lbs, 40 lbs more than the other two models. This is the scale to get for bigger users with bigger needs. The Plus model of the Precision is for the bigger users. In fact, everything about it is bigger with a bigger platform, bigger display and bigger weight limit. This makes it a great buy for the price, although it is hampered by it too in that it can be hard to fit into smaller bathrooms. Furthermore, it seems to have a minor design issue that makes it relatively easy to break if you slide it with sufficient speed and force into colliding with a hard object from the side. 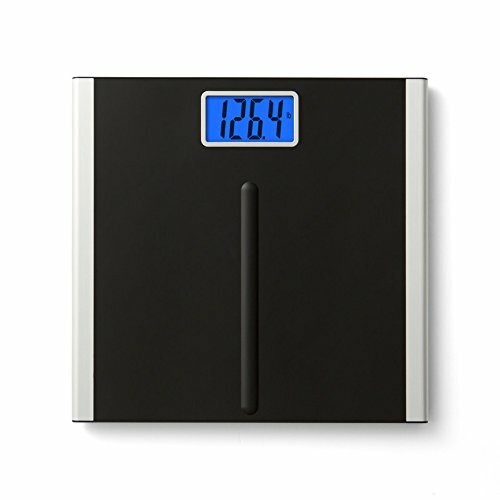 All three are great digital bathroom scales and the three models are actually quite similar. It really comes down to special preferences if you would prefer one over the other. For instance, those looking for something tougher would likely opt for the Premium instead. On the other hand, those seeking out something larger would prefer the Plus model. The latter model also uses only 2 AAA batteries (the other two use 4) so that may be a consideration for some as well. That said, for those without highly specialized needs, the model they are most likely to choose would likely still be the base Precision model. It may not be as sturdy as the Premium or as comfortable to stand on as the Plus (for larger people anyway), but it certainly comes very close. It doesn’t suffer their weaknesses in turn, being less likely than the Premium to show drastic recalibrations from misplaced rubber feet and less likely to break than Plus from a single hard slide into the wall. It also has just about all the essential features most people are looking for in a bathroom scale. There is a reason it has been Amazon’s top selling scale for several years. Whichever scale a buyer does get, there will likely be little complaint about its performance. EatSmart are known for standing behind their products, even going out of their way to contact and offer replacements to buyers who report defective units. That makes all of the above strong candidates for anyone looking to acquire a good digital scale at home.